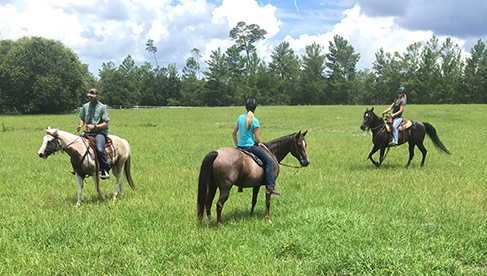 Situated in Geneva, Florida, just outside of Orlando, Rafter P Ranch, home of Rafter P Horse Training, sits on 35 acres of beautiful Florida grassland, with easy access to trail rides. 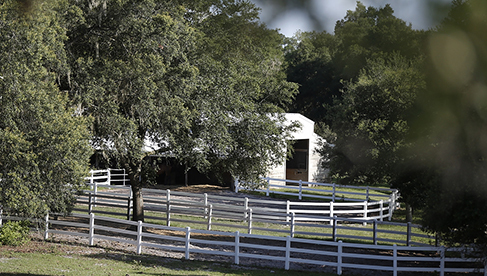 The Ranch's facilities include a large and lighted outdoor arena, a covered arena, round pen and pastures - all of which provide excellent riding opportunities as well as picturesque scenery. 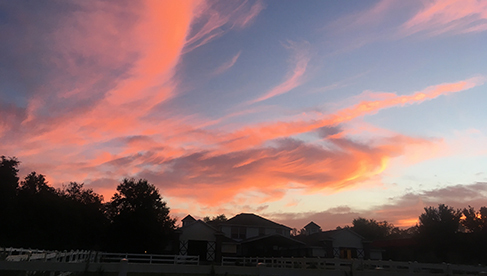 The atmosphere at the Ranch is one of its best qualities. 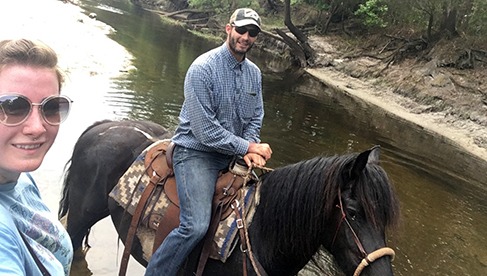 For Rafter P, working with horses isn’t a job, "it’s who we are." 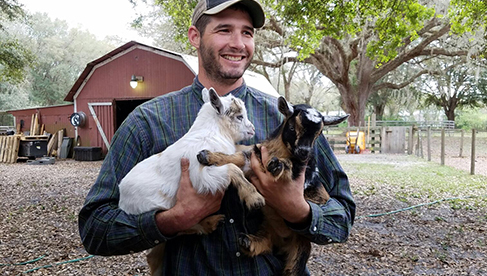 While the Rafter P crew and guests do enjoy taking advantage of the local beaches on days off, they also love to spend their free time on the Ranch, playing with the many rescue animals, working with cattle, playing broom-ball horseback, and making horse gear in their very own leather-working room. 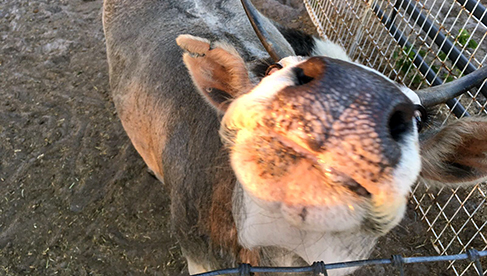 They also love to visit with other horse-people in the area, sharing ideas and learning from people from different disciplines and backgrounds. 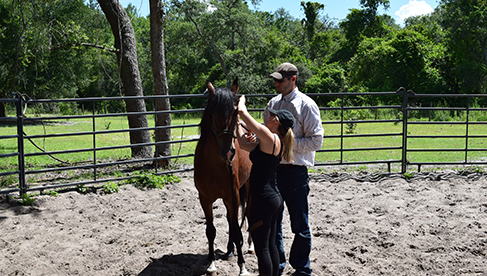 For over eighteen years, Head Trainer Chezz Perlini has been working with clients of all ages and backgrounds, including individuals, charitable organizations, show barns and other trainers and professional riders. Chezz has always enjoyed working with students who share his passion for learning and growing as a rider and horseman. 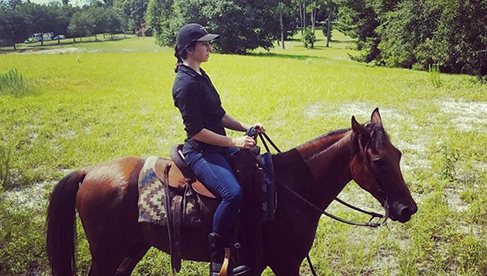 Chezz has worked with many breeds and types of horses including rescue horses, high-performance competition horses, wild mustangs, Warm-Bloods, Arabians, Paso-Finos and more. 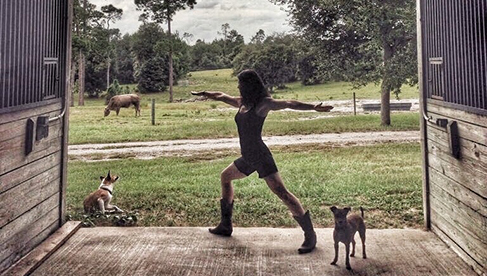 Chezz’s wife Nicole is a certified yoga instructor and a lifelong animal lover. 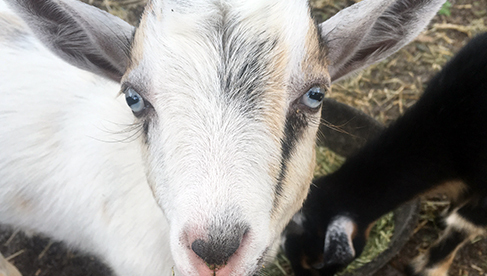 Thanks to her, the Ranch is also a sanctuary for rescue animals that have been searching for a forever home, including not just horses, but also goats, pigs, cows, zebus (mini cows), and dogs. 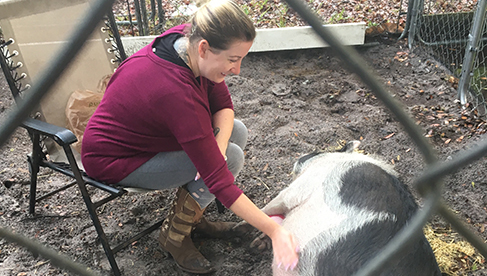 She enjoys sharing yoga with students at the Ranch, helping to improve not just strength, flexibility, and balance, but also focus, patience, and breath control. She also loves to travel, and is always up for exploring hidden gems in the area with visiting students. 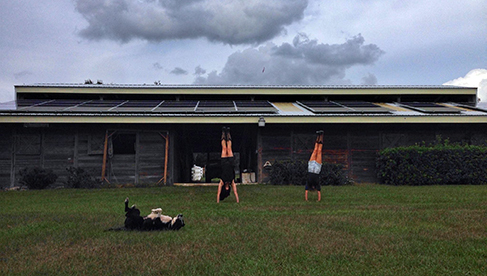 Both Chezz, through horse training, and Nicole, through yoga, have a deep desire to use their skills to help both animals and humans find connection, balance, and harmony. 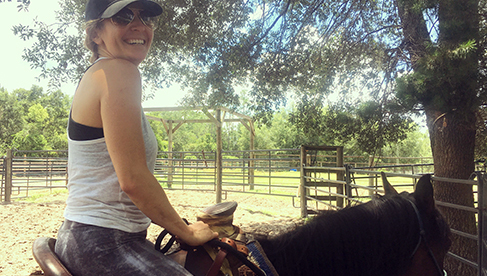 Rafter P offers several programs that help participants achieve these goals in riding, yoga, and in life. "We love what we do and we are excited to welcome you to our family!" 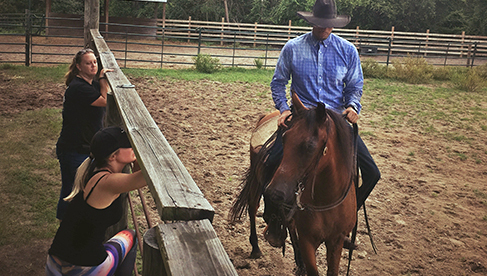 Learn about horsemanship and western riding while you train and rehabilitate rescued horses on this horseback riding vacation. Develop skills which will not only help you with your horsemanship, but beyond the world of horses into your daily life. Training horses, especially rescue horses, requires patience, understanding and introspection. Horses present an honest reflection of what you are bringing to every interaction; this allows you to see yourself as you are in the moment. By developing a sensitivity to this bias-free reaction, you can begin to work with consideration for yourself and your horse. o Weekly yoga classes to improve core strength, mobility, and balance. Optional additional classes for interested students. o Evenings and weekends to yourself. 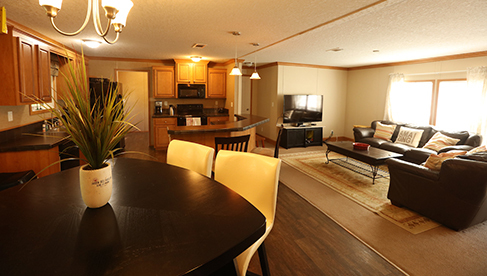 Relax in the beautiful accommodation and grounds, visit local attractions or enjoy the Florida sun. o Optional additional horse-related activities, such as lessons and clinics. o Train and relax at your own pace! The instruction for the Training Program runs Monday to Friday, so Rafter P recommends that guests arrive on Saturday so they have time to settle in before their first Monday morning. Take a deeper look at the way we communicate with our horses, and learn new skills to create positive interactions. 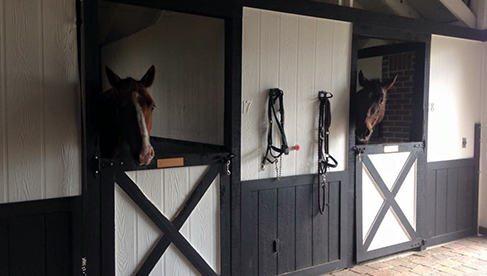 Expand your horsemanship toolkit to achieve a new level of balance and harmony. 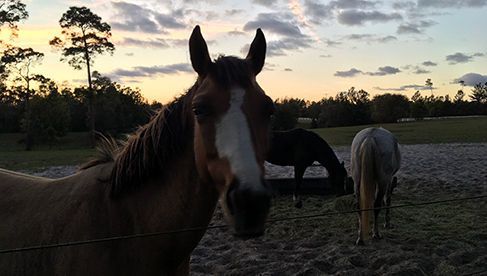 o Beginner to Advanced welcome on this Florida equestrian vacation! Ground, breathe, and learn to create and hold space for yourself and others, both humans and horses. Learn new skills to facilitate positive communication and leave feeling balanced and renewed. Self-contained, modern 3 bedroom, 2 bath home with air conditioning and all amenities including a TV room, full kitchen and dining area and outside porch with seating area. The accommodation has its own laundry facilities, WIFI, and parking. Maximum of 2 guests per room (private room upon request with an additional fee.) Bathroom and common areas are shared among all guests; maximum of 6 guests. 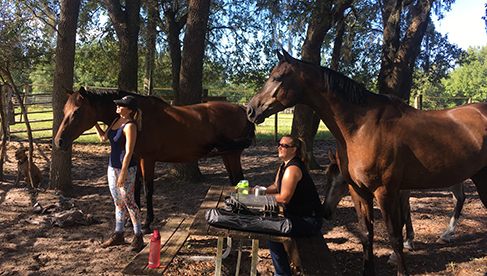 Weekend Retreats (Horsemanship and Yoga Ranch Retreats) are all inclusive (3 meals a day plus snacks and non-alcoholic beverages); dietary restrictions can be accommodated with notice at booking. 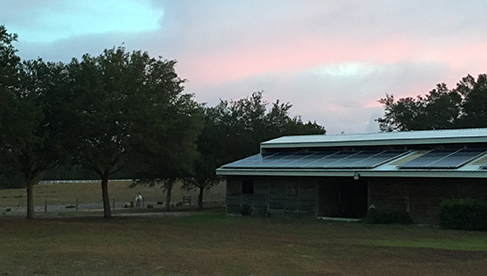 Residential Rescue Horse Training Program provides breakfast, snacks, drinking water, and regular transportation to local stores for necessities; lodging has a fully outfitted kitchen. Rafter P also provides a Sunday night “family dinner” for everyone to get to know each other, ask questions, etc., so it’s nice for new clients to be able to join in on that first Sunday. Rafter P is a unique horse training and riding ranch where we use our skills and experience to help both animals and humans find connection, balance, and harmony through horsemanship, horseback riding, yoga and more. Rafter P does provide transportation to and from the airport.